An other AA FanArt, I only want to say, I started this drawing to early because spoilers. Mia Fey, Ace Attorney, FanArt. it happens to you that when you do a drew something and for any reason you like more than the rest of your work. well, that happened with me right now. I love your art style! Hope you continue to post more! You need to see this and pass it on to your friends. You're sinking SO low that you're using names of dead people, EVEN ones that are basically decorative or heck HEROES of the last great war to push the repeal? How DESPERATE and SICK are you, you heartless freak? So.... Ajit and FCC seems to have committed FRAUD. owo; That's all. Let it sink in. What does this mean now, pals? I'll be providing more evidence to come to support some of my previous statements here for those asking if this or that is true or not. ;3 I'll update abit frequently or until I got all I needed. Update 1: Can people see the journal again when it updates...? .w. Screw it, I'll do it anyways. Listen up guys! 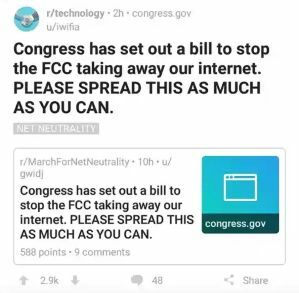 Congress is making a bill to stop FCC right here and now! May I ask you something do you take request?